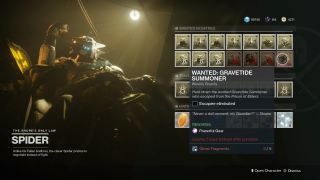 Bounties have long been part of Destiny 2's endgame lifeblood, and Forsaken - Bungie's latest expansion to its MMO/shooter hybrid - brings even more of the weekly hunts to any Guardians up for the challenge. This time, they come in the form of Wanted bounties, which can be collected from Spider, completed, and redeemed for high-end loot every week. Spider, one of Forsaken's new vendors found in The Tangled Shore, sells 14 new Wanted bounties per reset, and each one can cost between one to five Ghost Fragments. You can read our separate guide on how to get Ghost Fragments if you're struggling to pay for each bounty, but know that your Guardian can only carry up to ten of them at a time, so you'll need to come back to Spider repeatedly if you intend to complete all 14 Bounties in one week. To finish a Wanted Bounty, you'll need to hunt down and kill an escaped Prison of Elders convict, most of whom will be located in Lost Sectors, Patrol Spaces, and Adventures around the galaxy, usually centred around the Flashpoint location of the current week in Destiny 2's season. Below, you'll find a guide to getting all 14 Wanted Bounties for this week (September 25 - October 2), including the info you need on their location, cost, and more. Gravetide Summoner is an Adventure that can be started in The Rig area on Titan. Begin the Adventure by activating its beacon located on your map, and you'll be guided through the DS Quarters-2 Lost Sector, inside which will be Hive mobs that can be skipped if you just want to head to the miniboss at the end. At the final section of the Adventure are two Witches. Killing one of them will spawn a Gravetide Ogre miniboss, and you'll need to defeat him in order to bring out the Gravetide Summoner herself. During this fight, plenty other Hive enemies will spawn, including Gravetide Thralls; kill these guys to attain the Ogre's Fury buff, which lets you deal more damage to the Ogre for 10 seconds. The Gravetide Summoner is a Witch boss, and is most easily defeated with Supers, Power Weapons, and any other explosive attacks you can deploy. Upon killing her, the Adventure will finish, and you can redeed the Wanted Bounty in your inventory. The Downpour Captain is a Fallen Captain boss that can found at the end of The Weep Lost Sector in the Winding Cove area on The EDZ. Run through the lost sector, kill hiim, and you'll be able to redeem the bounty in your inventory. Zerz, the Unstoppable Weight - a Cabal Incendior miniboss - is located in Firebase Hades area on EDZ, within the Pathfinder's Crash Lost Sector on the South East part of the map. Clear the enemies in Pathfinder's Crash, and Zerz will be drawn out, at which point you can kill him to redeem the bounty. This bounty resides on the EDZ, as the end miniboss to the Excavation Site XII Lost Sector on the East side of Firebase Hades. Enter the cave, follow it through to the end, and you'll find Dust-Choked Thrag - a Cabal Centurion miniboss - alongside a bunch of other Cabal enemies. Clear the area and redeem the bounty for more rewards. Kurg, The All-Seeing Force is a Cabal miniboss located in the The Pit Lost Sector on EDZ, more specifically in the North West corner of the Firebase Hades area on Earth's patrol zone. Kurg is the final enemy at the end of the Lost Sector, so kill him, and the bounty will be complete. Karagul is the final miniboss of the Methane Flush Lost Sector in Siren's Watch, Titan. You can find the Lost Sector on the North East corner, on a lowered platform near the edge of the rig. The boss is a Fallen Wizard at the end of the Lost Sector; kill him, and redeem the bounty from your inventory. Head to the Terminus East Lost Sector in the Norst East part of Trostland on EDZ, and Sunless Captain - a Fallen Captain miniboss - will await your arrival at the end. Kill him to redeem the bounty. Ruined Mind, a Vex Hydra, can be found as the last miniboss at the end of the Aphix Conduit Lost Sector on IO. This Lost Sector is in the South East section of The Rupture, at the bottom of the patrol zone. Head through the Sector, and at the end you'll find the boss, ready to kill and be redeemed in your inventory. Qeldron, Keeper is in the Grove of Ulan-Tan Lost Sector on IO, situated on the North West side of Lost Oasis. Enter the cave and towards the end of the Lost Secor, where you'll find Qeldron, a Hive Minotaur, as the last miniboss of the activity. This bounty hides in The Carrion Pit Lost Sector on Nessus, in the centre of the Glade of Echoes area on the South East side of the map. Enter the Sector, and you'll find Nariks Reborn, a Fallen Servitor miniboss, awaiting you at the cavern's end. Saturn Survivor is a Taken Captain who can spawn in the Sludge zone on EDZ. You'll need to wait in the centre of the area until "The enemy is moving against each other" notification pops up on the corner of your screen. The Taken and the Cabal will be fighting each other, and Saturn Survivor will be there to take for the bounty. Pakrion is the end boss of the Ancient's Haunt Lost Sector on the western border of The Tangle on Nessus. Clear out the Lost Sector, and Parkion - a Vex Harpy - is there to be defeated at the end. This bounty is a random High Value Target that spawns around the The Winding Cove area, in the South West of EDZ. Head to this area, and wait for the notification "A high value target is nearby" to pop up in the corner of your screen. If you're lucky, the Braccus - a Cabal miniboss - will have spawned in, and you'll be able to kill him for the Bounty. Splendid Mind is another High Value Target, this time found on Nessus, in the Glade of Echoes zone on the south eastern part of the map. The Hive Minotaur will have a chance to spawn in this area, once the High Value Target notification appears on the screen, though its randomly generated, so you may to reload the area once or twice for another shot at it. Once he's killed, you can redeem the Bounty in your inventory.